Discussions Regarding the Preschool Observation Checklist and Evaluation Tool (POCET): Counting the Moves! Children often greet the upcoming Valentine's Day holiday with heightened enthusiasm and extra energy. And for good reason - what child doesn't love the arts and crafts, the sweet treats, the classroom parties, and, of course, the Valentine cards? Because extra excitement around holidays can lead to difficulty focusing, this time of year offers a great opportunity for children to learn and grow through language and listening. 1. Tell the children that you are going to see how well they follow directions. 2. Have the children spread out in the activity space. 3. Allow the children to help decide on a movement. For example, jumping up and down in one place. 4. Have a child roll the dice (or spin the spinner). Tell the children what number is indicated on the dice or have the children count the number of dots. 5. Have the children jump up and down the indicated number of times. This is also fun to do when the group counts the jumps out loud. 6. 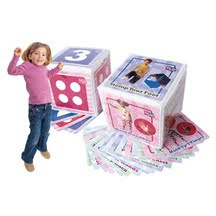 Repeat the activity with another movement and another child rolling the dice. For more great developmentally-apppropriate activities, visit Teacher QuickSource® and browse through all age areas, including Preschool, Kindergarten, Infant, Toddler, and Head Start. Don't forget to explore activities promoting environmental awareness at Environmental QuickSource®.